The prospect of besting 99 other gamers through sheer resourcefulness and daredevilry is why the battle royale genre has become so compelling to millions of gamers. Survival shooter Battlegrounds now has the second all-time highest concurrent player count on Steam, and today, Fortnite, a multiplayer game about building forts and defending against zombie swarms, just launched its own standalone battle royale mode for free. It sparked a little controversy after Battlegrounds’ developer BlueHole raised an eyebrow. But, questions of copyright aside, Fortnite’s battle royale mode is solid and joyous to play, a welcome respite from the more tedious parts of Battlegrounds. Fortnite’s base game entails building and defending forts against incoming swarms of enemies called husks. In my impressions of it, I felt that its over-complicated progression system obscured what is, at base, a very good game. Since August, I’ve been waiting for a reason wade through my frightening to-do list of awarding XP, unlocking heroes, leveling up abilities, navigating skill trees and figuring out what the hell “survivor” cards do—all so I could enjoy Fortnite’s clean-feeling mechanics, sugary cartoon world and diverse cast. Fortnite is a tower defense, player-versus-environment, resource management, third-person shooter/builder, so why not throw a little battle royale in there, too? Fortnite’s battle royale mode takes everything I want to love about Fortnite and provides a fresh context that lets me love it unabashedly, without the weight of an over-complicated meta-game. It’s a last-man-standing mode in which 100 players are dropped onto an island, gather guns and shoot each other down, all while a “storm” constricts the playable area into a smaller and smaller circle. To defend themselves, players can construct forts out of whatever they amass from destroying buildings or environmental objects like cars or dumpsters. Strong impulse control, quick-wittedness and spatial awareness will carry players far, but always working against them is the threat of random, unforeseen death by enemies they can’t account for. It might sound a smidge familiar. Immediately after hopping into my first game, I understood the public skepticism Battlegrounds’ developer expressed over the obvious similarities. Players are thrown into a lobby where they run around and hack at each other. They’re then shuffled onto a floating vehicle (a bus—not a plane) from which they dive toward an island. From there, they collect guns from buildings, mostly clustered across a hilly, green map. They can play in singles or squads, and soon there will be supply drops and cosmetic items. A little awkward is the fact that Fortnite’s developer Epic Games also makes Unreal Engine 4, which Battlegrounds runs off. There’s no point being coy about it: Fortnite’s battle royale mode is crazy similar to Battlegrounds. Developer Epic Games certainly was not coy: the studio’s creative director even directly referenced Battlegrounds in a PlayStation blog explaining their motivations to develop the battle royale mode. 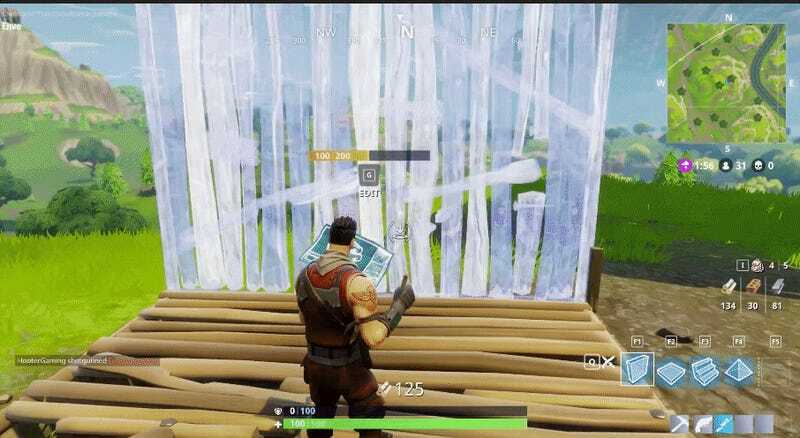 Truly, the parallels are glaring, minus Fortnite’s fort-building mechanics. Those fort-building mechanics are a welcome replacement for Battlegrounds’ obsession with whiling the game away gathering guns, ammo, armor, scopes, silencers and whatever else before, inevitably, getting head-shotted from a motorcycle side-car by a more gifted player. 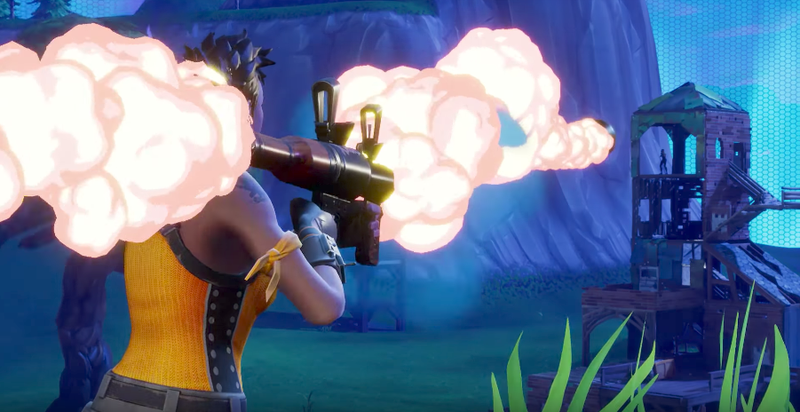 In Fortnite’s battle royale mode, guns and ammo are still hot commodities, and it’s important to grab them immediately after landing. However, there are no real add-ons to chase aside from traps and medicine. It’s great. I’d much rather hack away at things, collect materials and construct small huts from which I can shoot at opponents in my time between landing on the island and getting killed by someone better than me. And, anyway, it’s about as exciting for a stranger to infiltrate your fort and head-shot you as it is to get head-shotted from somewhere totally unknown. The construction mechanics lets players make forts and barriers to protect themselves, but they also make it very difficult to stay sneaky. Demolishing environmental items for materials makes noise, which can draw attention to you. Unlike Battlegrounds, complete silence isn’t really an option, so games move a little more quickly. Also, as the storm closes in, forts might get zoned out, forcing players to abandon their new homes, which they hastily deconstruct. In Fortnite battle royale’s squads, I was hugely compelled by strategies that involved splitting up duties. One person would construct a fort and another would defend it while the third and fourth player would aggressively pursue opponents with gunfire. With more asymmetric roles than Battlegrounds, squads felt dynamic and tactical in ways I hadn’t previously experienced in this genre. Two big things Battlegrounds gets right are lacking in Fortnite’s battle royale: cars and that ineffable “gun feel.” There is no powerful force behind shooting in Fortnite; it feels inconsequential. Epic Games says they’re working on it, but frankly, I can’t imagine how they could approximate the jump-scare rush of firing a semi-automatic inside Battlegrounds’ terrifying hospital. The reason why Battlegrounds has captivated millions is because it’s a jumpy, raw, high-risk firecracker of a game that feels a little like the good parts of gambling. 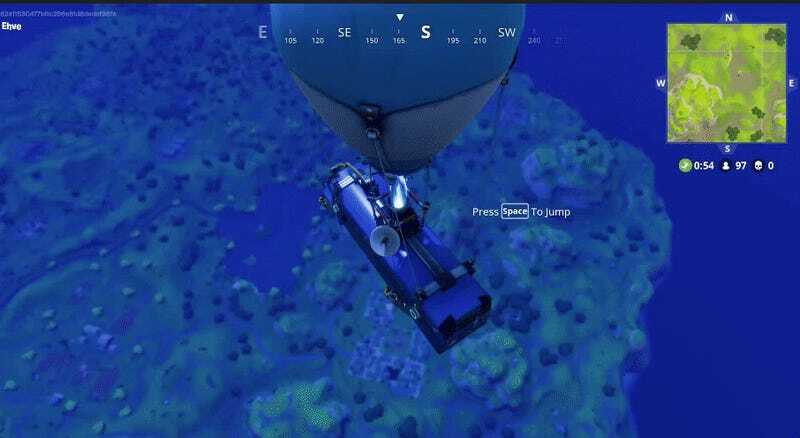 I’m not sure that Fortnite, which its cutesy aesthetic and weaker feedback, could design that vibe in a game, or should even try to. So, what does it matter that these two games are so comparable in the first place? I am not BlueHole, who are perhaps rightfully concerned about how similar these games are. I am but a humble fan of Battlegrounds who has small complaints about its emphasis on gathering loot, as well as a wanna-be fan of Fortnite who has complaints about the main game’s clunky progression system. And, thankfully, those complaints are done away with in battle royale mode. So I am convinced that Fortnite’s battle royale mode is superb and euphoric, especially in squads. So, I am choosing not to make its liberal use of Battlegrounds’ designs an issue for me and will, for the time being, be voraciously playing it in lieu of Battlegrounds until, maybe, the guilt will creep in.